Tokyo is often pictured as this high tech city with towering buildings and fast paced life supported by robots and other technologies. In light of this vision it would be easy to forget the many parks and gardens that seem to adorn every neighborhood of this metropolis. Each of these green spaces are unique in their very own way and have very distinct characters. To have the privilege to relax in these city oasis, you do have to pay an entrance fee. However, it does seem this fee is waived on weekends – at least we didn’t have to pay to get in Yoyogi Park on the Sunday we went for a stroll. Also, in every park and garden we visited you couldn’t get in past 16:00 and had to be out by 16:30. Moreover, they were closed on Mondays. This being said, it would be hard for me to guarantee that these facts apply to every single one of them. 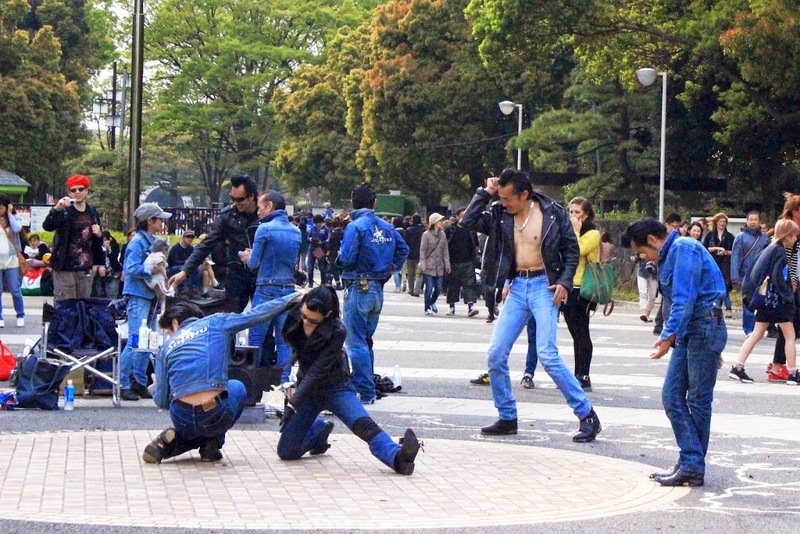 I had heard that Yoyogi Park was the place to be on a Sunday morning. Let me tell you that we were not disappointed. Playing kids and dogs, picnicking families, crowds of cool kids lounging around or playing ball, street performers, jugglers, clowns and kid acts, a string quartet rehearsing and a martial arts mime act – that’s the sight that greeted us on this sunny morning. This is not the most peaceful park and it doesn’t have nearly as much cherry trees as other park, but considering all the life happening here, I would say this was my favorite. Yoyogi Park is located adjacent to the Meiji Shrine and the Harajuku Station. You can get there by getting off at Harajuku Station on the Yamanote Line. 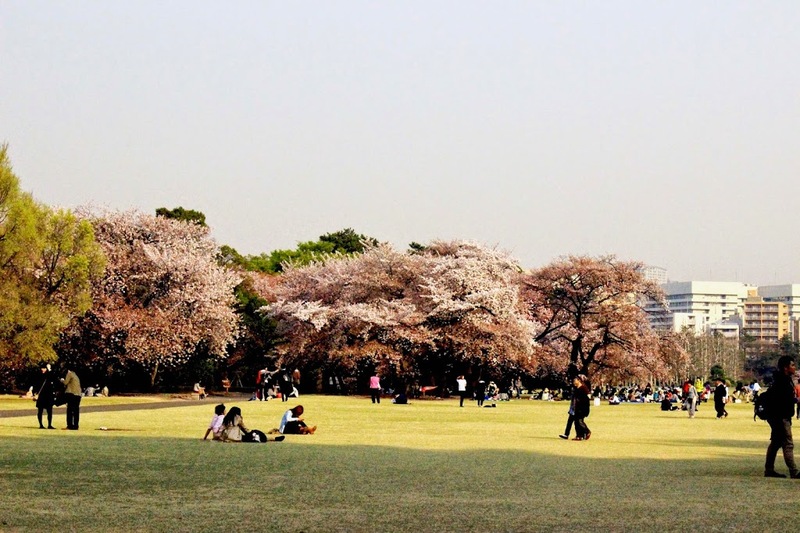 You won’t see the gardens of Shinjuku or the performers of Yoyogi Park in Ueno Park. This does not mean it isn’t worth your time. There are plenty of other things to see (like a temple, some museums, a pagoda, a zoo and some cafés). As a park, it is mainly characterized by trees and wooded areas. With the number of trees there, you can imagine this is the place to be to enjoy the blossom season. While you’re there, you can pay a visit to the animals in the zoo if this is something of interest to you. You can get there by getting off at Ueno Station on the Yamanote Line. 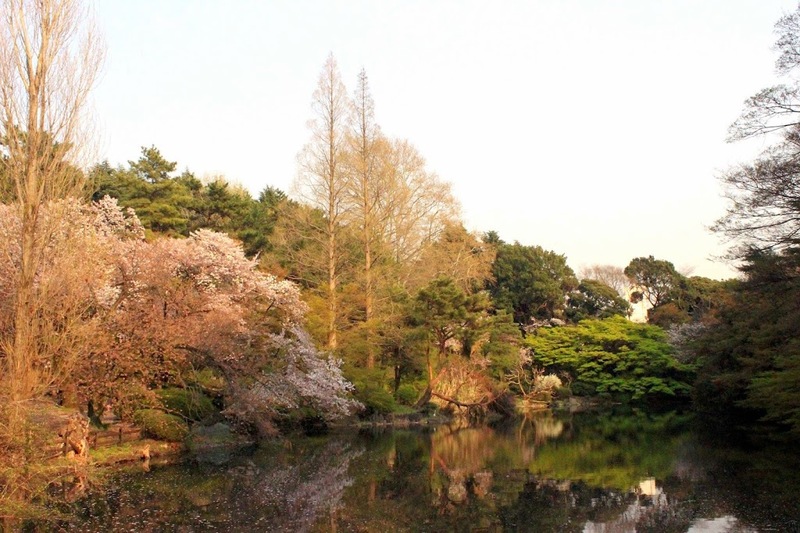 Shinjuku Gyoen National Garden, as the name suggests, contains some pretty amazing gardens. It houses the largest traditional Japanese garden of Tokyo, as well as a Taiwanese Pavilion, a green house, a French garden and some rivers, ponds and footpath bridges. The French garden contains both roses and poplar trees. The greenhouse contains native and endangered plants, but sadly for me I couldn’t see them as the greenhouse was closed at the time of my visit. Also, I wouldn’t call the English garden an English garden, it is more of a well-tended big lawn – which happens to be perfect for picnics. When we went there, the trees were flowering. We spent a good part of the day reading and napping there on an improvised blanket (i.e. the sarong I had bought in Bali earlier). This is really a four seasons park. 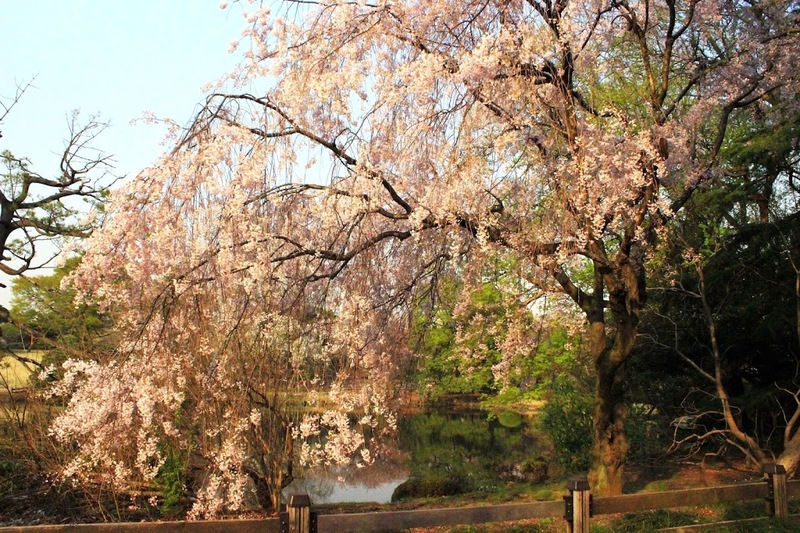 Spring is perfect to witness the cherry and apricot blooms with 65 variety of cherry blossoms and about 1300 blossoming trees. Summer is for the roses, tulips, singing cicadas and flying dragonflies. Autumn for the leaves that change colors. Finally, winter is supposed to be a great time for bird watching and for seeing the orchid collection in the greenhouse. You can get there by getting off at Shinjuku Gyoenmae Station on the Marunouchi Subway Line. It seems we didn’t walk along the right part of the neighborhood since, much to our disappointment, J and I did not see any of the much talked about Harajuku girls. We did try. Having failed this objective of our “mission”, we proceeded to shop for some clothes that J could take back with him as souvenirs. We did succeed at this objective and J now has three Japanese shirts to adorn his closet at home. It is also in the Shinjuku neighborhood that you can find a free alternative to the Tokyo Skytree:the Tokyo Metropolitant Government Office (address: 2-8-1 Nishi-Shinjuku, Shinjuku, Tokyo Prefecture 160-0023, Japan).